Richard A. (Rick) Brown was a founding partner of the firm in 1977. His practice, in recent years, was primarily devoted to products liability and transportation litigation. Rick retired from the active practice of litigation effective 12/31/14 but remain of counsel to the firm. He is a certified mediator and is currently limiting his practice to mediations and arbitrations. Admitted to all of the state and federal trial and appellate courts of both Georgia and Florida, he is also admitted to practice before the Eleventh Circuit, as well as the United States Supreme Court. He received his BBA degree from Loyola University in New Orleans in 1969 and his Juris Doctor from the University of Georgia in 1972, where he was a member of the Georgia Law Review. He was admitted to practice in Georgia in 1972 and in Florida in 1973. 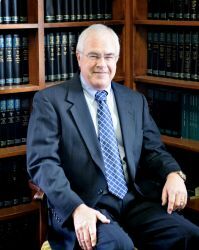 Rick has tried well over 100 civil cases to jury verdict as well several hundred workers’ compensation and other administrative trials. A former President of the Brunswick Glynn County Bar Association and member of the Southern District Advisory Board, he is currently a member of the Georgia Defense Lawyers association, American Association for Justice, Trucking Industry Defense Association, American Board of Trial Advocates, and the Roscoe Pound Institute. Jones v. Honda A products liability case in which a catastrophically injured motorcycle rider alleged his accident resulted from defects in the design and manufacture of his motorcycle. Representing the manufacturer and other related entities in a 10 day in the U.S. District Court for the Southern District of Georgia, he obtained a complete defense verdict for all defendants. Karoly v. Kawasaki. A products liability case involving a JetSki which was subsequently recalled for ‘high speed instability.’ The plaintiff alleged life altering injuries as a result of the instability defect. Representing the manufacturer and related entities, he challenged the plaintiff’s version of events, and, after a two week trial in the State Court of Fulton County, the jury returned a verdict for all defendants. Cartrette v. Carolina Transport. A wrongful death case involving a wife and mother struck and killed by a tractor trailer while crossing a rural highway. The defense alleged comparative negligence on the decedent and a jury in the Superior Court of Pierce County returned a verdict for the defendants. Hawkins v. Superwinch A products liability case where the plaintiff alleged a winch failed, causing him to be struck by a falling container weighing several hundred pounds, resulting in a debilitating back injury. The defense was misuse of the product and a jury in the U.S. District Court in Savannah returned a verdict for the defendants. Pittman v. Gilman Paper Products A wrongful death case where a driver was struck and crushed by log truck while awaiting entry to a paper mill. The defense was based on comparative negligence and, after a week long trial, a Superior Court jury returned a verdict for all defendants. Confidential Resolution In a malpractice case against a major medical facility on behalf of a profoundly brain damaged child, Rick secured a confidential seven figure resolution on her behalf.